As we are writing this blog post, the country is grieving for families in Oklahoma after a tornado outbreak that killed dozens and injured many hundreds more. We are certain that with the help of neighbors and the selfless giving of so many Americans that the victims and their communities will find the hope and strength to recovery. And when that recovery comes, it’s important that homeowners consider the appropriate inspections before making repairs or rebuilding. It’s an issue that FEMA addressed in the days after our country’s last significant natural disaster, Hurricane Sandy. In the case of chimneys, natural disasters have the potential to create hidden, but serious, damage. This is why we strongly recommend that all homeowners impacted by tornadoes or other weather events schedule a chimney inspection with CSIA Certified Chimney Sweep, even if it appears that their structures are still sound. 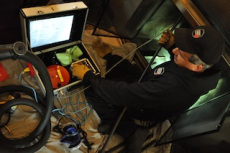 Conducting a more exhaustive Level 2 Inspection, a certified sweep will check the integrity of the chimney exterior and also review the interior of the appliance for the kind of hidden damage that would allow the escape of heat or hazardous gases into your living space. The last thing anyone wants is for additional tragedy to strike in the wake of a terrible disaster, and a chimney inspection is one way to help prevent such events from happening.